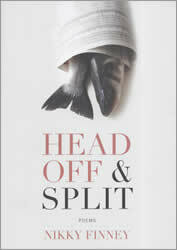 I've followed Nikky Finney's writings for years now, but finally committed to writing about her regularly this earlier this year with the publication of her book Head Off & Split. Finney also has published four other volumes, The World is Round (2003), Rice (1995), and Wings Made of Gauze (1985), and a collection of short stories Heartwood (1997). She is also editor of the collection of The Ringing Ear: Black Poets Lean South (2007). I plan to continue developing this digital notebook concerning her work.